To be a high performing business, you require effective metrics and measurements that will help you gain valuable performance insights which will help drive informed and strategic decisions for your organization. 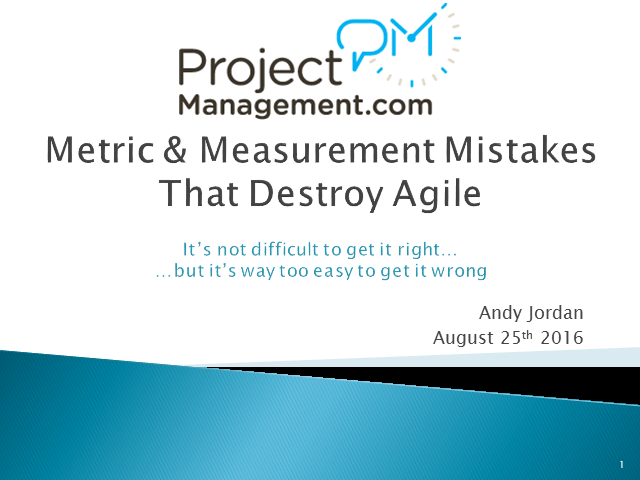 Join Andy Jordan, ProjectManagement.com as he discusses what people are doing wrong when it comes to Agile metrics and provide guidance on how to get it right – the first time. Andy will also discuss the risks of using common metrics between Agile and waterfall approaches as well as why organizations need to focus on value-based metrics rather than arbitrary metrics of progress. This session is approved for 1 Project Management Institute (PMI) PMP PDU Credit.